Democrats in the State Senate voted this week to approve significant concessions and structural changes--the types of structural changes many of us have long sought--to Connecticut's state employee labor agreements, negotiated by the governor and the State Employees Bargaining Agent Coalition (SEBAC). This vote is just the latest step Democrats in Connecticut have taken to make government more affordable and more efficient for our taxpayers, and the labor concessions in this agreement represent the most critical piece crafting our next biennial state budget--eliminating about a third of the projected state budget deficit. An outside, independent analysis confirmed that the labor givebacks contained in the new SEBAC agreement make important and long-term changes to our state employee pension and benefit programs, resulting in significant savings for taxpayers--about $24 billion over the next 20 years. The independent analysis found that the plan changes will produce cumulative savings of $1.57 billion over the next two years, and about $5 billion in savings over the next five years. In recent years, the legislature has taken significant steps to reduce the size of state government and to fund our long-term pension obligations for our exiting (not already retired) workforce. Over the last 10 years, Democrats have shrunk Connecticut's state employee workforce by more than 15 percent (52,193 to 44,130), and we have reduced the number of managers over the past 10 years by 33 percent. We are cutting government jobs at a time when Connecticut is experiencing its 83rd consecutive month of private-sector job growth, and the private sector has regained 102 percent of the jobs it lost during the Great Recession. Included in the labor concessions package that Democrats approved is a new 401k-hybrid retirement system for new state workers. The agreement completely restructures Connecticut's pension system for the future, while respecting the contractual agreements that have been made in the past. The agreement takes advantage of a demographic reality--it is estimated that at least 25 percent of our state workforce is likely going to retire before the existing SEBAC agreement ends (and remember, the state workforce is already 15 percent smaller than it was 10 years ago!). This new, updated labor contract allows Connecticut to change its benefits structure five years earlier, meaning there will be more than 10,000 employees enrolled in a new, cheaper pension plan before 2022. Without a new SEBAC agreement, those 10,000 employees would have been in a more expensive pension plan. This contractual giveback alone will save Connecticut taxpayers about $77 million over the first two years, with the savings increasing to $97 million annually by 2037. These proposed pension changes will save Connecticut $210 million in Fiscal Year 2018, which began on July 1, and $238 million in Fiscal Year 2019. Over the course of the agreement, the amount of money Connecticut needs to contribute to these pensions could decline by as much as $500 million (half a billion dollars!) per year. This new agreement that Democrats voted to approve modernizes state employee health benefit plans to reflect the best thinking about how to keep employees healthy at the lowest cost. These health benefit changes alone will save $136 million in the first two years, but when you add in the employees' higher premium cost-sharing and prescription drug changes, those annual savings increase to more than $100 million per year into the late 2020s and early 2030s. 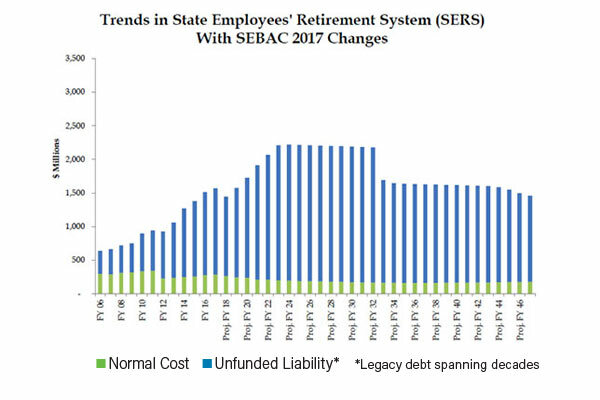 This new, changed SEBAC contract truly makes major changes to the retiree health benefits, producing an immediate and significant savings for taxpayers while gradually shifting more costs on to state employees and state retirees in the future.